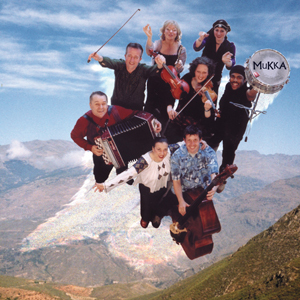 Mukka are the ultimate live band, whisking their audience on a whirlwind journey through deepest Transylvanian melancholy to joyful abandon, whipped up by frenetic Balkan instrumentals. If you can get a bunch of people, who’ve never met, to join hands and dance themselves crazy in a circle in London, you can do it anywhere. And Mukka have done it everywhere from Glastonbury Festival to the Queen’s Concert at Buckingham Palace. 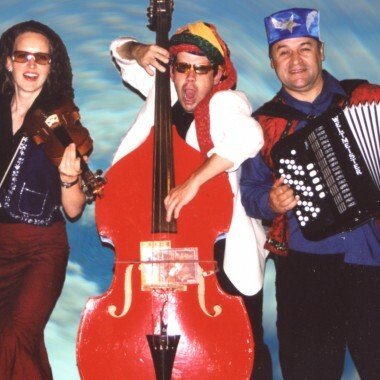 Mukka played to crowds of 5000 supporting ‘The Beat’ at Glastonbury Festival and at the Trafalgar Square Romany Festival. They entertained the Sheikh of Al’ Ain in The United Arab Emirates, The Sultana Of Oman at her UK residence in Surrey, and at the Queen’s Jubilee Concerts at Buckingham Palace. They have also appeared at The South Bank’s Purcell Room, The Barbican, Meltdown Festival, Coin St Romanian Festival, Spraoi in Waterford Ireland, Refugee Week, and Art Centres throughout the UK. The late John Peel once described them as “the sensation of Glastonbury” and invited them to record a John Peel Session, opening up their music to a whole new audience. Mukka’s third CD ‘Life, Life!’ combined Dana’s Transylvanian ballads with a strong contemporary feel and dancy rhythmic drive. Mukka have re-invented the Romanian doina, a traditional song form in free improvisational style, imbuing it with a fresh rhythmic backing which earned them a credit in Songlines magazine as “the doyens of doina.” The album was described as “high-voltage, eminently danceable… clearly has ‘FUN’ stamped all over it….hey, this is a party!” A sample from Mukka’s first album ‘Skip Lizard’ features on the theme tune to the ‘Amazing Adrenalini Brothers’ cartoon series (ITV and Cartoon Network). The band brings together eminent musicians from former Yugoslavia, Russia and Romania, with fresh UK talent from Scottish, Celtic and Jazz backgrounds, and features violins, accordion, flute, traditional percussion and a modern rhythm section. The result is a most exciting example of highly original music, which spans east and west and where new compositions sit alongside reworkings of traditional tunes sourced from all over the Balkans and the Middle East. 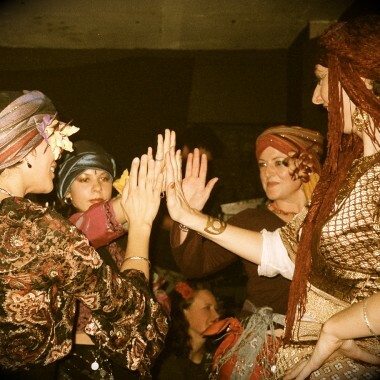 Mukka have toured France, Switzerland, The Middle East and Eastern Europe. Besides doing a John Peel session, they have played live on BBC London’s Charlie Gillett show, on BBC World Service’s ‘Outlook’ and ‘The Ticket’ and were interviewed on TV by Sacha Baron Cohen (aka Ali G).